5.8 (B/C). Show that for the symmetrical section shown in Fig. 5.13 there is no stress in the central web. Show also that the shear stress in the remainder of the section has a value of T/4tb2. 5.10 (C). The cross-section of an aeroplane elevator is shown in Fig. 5.15. If the elevator is 2 m long and constructed from aluminium alloy with G = 30 GN/m2, calculate the total angle of twist of the section and the magnitude of the shear stress in each part for an applied torque of 40 Nm. 5.11 (B/C). Develop a relationship between torque and angle of twist for a closed uniform tube of thin-walled non-circular section and use this to derive the twist per unit length for a strip of thin rectangular cross-section. Use the above relationship to show that, for the same torque, the ratio of angular twist per until length for a closed square-section tube to that for the same section but opened by a longitudinal slit and free to warp is approximately At2/3b2, where t, the material thickness, is much less than the mean width b of the cross-section. 5.12 (C). 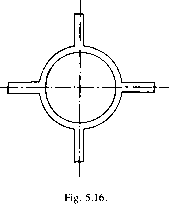 A torsional member used for stirring a chemical process is made of a circular tube to which is welded four rectangular strips as shown in Fig. 5.16. The tube has inner and outer diameters of 94 mm and 100 mm respectively, each strip is 50 mm x 18 mm, and the stirrer is 3 m in length. If the maximum shearing stress in any part of the cross-section is limited to 56 MN/m2, neglecting any stress concentration, calculate the maximum torque which can be carried by the stirrer and the resulting angle of twist over the full length. 5.13 (C). A long tube is subjected to a torque of 200 Nm. The tube has the double-cell, thin-walled, effective cross-section illustrated in Fig. 5.17. Assuming .that no buckling occurs and that the twist per unit length of the tube is constant, determine the maximum shear stresses in each wall of the tube.